Vampire Diaries hunk Ian Somerhalder and Nikki Reed’s whirlwind romance has been the talk of the town, and possibly one of the fastest moving relationships in Hollywood. 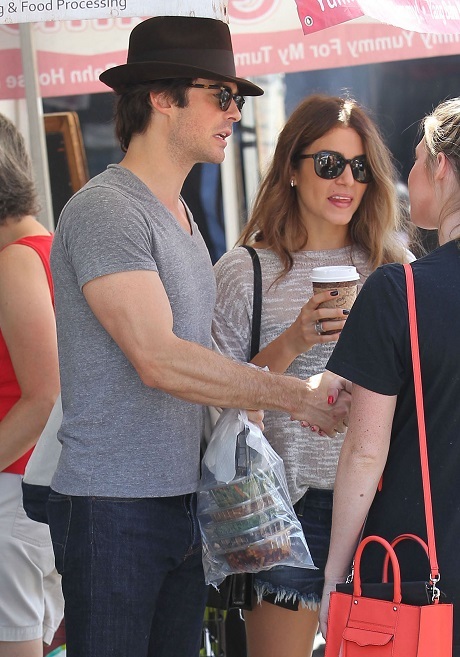 Just last month the couple was spotted hugging and holding hands at a Farmer’s Market, and since then they have been inseparable, despite protests from legions of TVD fans who were hoping Somerhalder would be reuniting with co-star and on-again off-again girlfriend Nina Dobrev. According to the September 8th edition of OK! Magazine, Ian and Nikki’s relationship is moving ridiculously fast, and Nikki is practically living at his apartment and already moved in some of her things. The magazine goes on to reveal that not only is Nikki taking up residence at Ian’s house, she has changed her work schedule to coincide with his and is even supporting his charities. Nikki Reed has a history of moving way too fast in her relationships; she married Paul McDonald after dating him for just 11 months, and their marriage crashed and burned. Nikki fell hard and fast for Ian, but sources have revealed there may already be trouble in paradise. A source close to the couple tells us that Nikki is beginning to second-guess her relationship with Ian, and the novelty of playing house with him is wearing off. Do you think that Nikki and Ian make a cute couple, or do you think the rumors are true and Ian is too boring for Nikki? Or would you rather see Ian dump her and get back together with Nina Dobrev? Let us know what you think in the comments below. Nina Dobrev Waiting For Ian Somerhalder To Break Up With Nikki Reed – Vampire Diaries Elena Wants Her Damon Back!